To solve these challenges, consider metamaterials; materials that allow control of the properties of light-matter interactions at the fundamental level. The building blocks of metamaterials, known as split-ring resonators, can be designed to exhibit strong electric and magnetic response to electromagnetic fields over a wide frequency range, from terahertz to infrared. 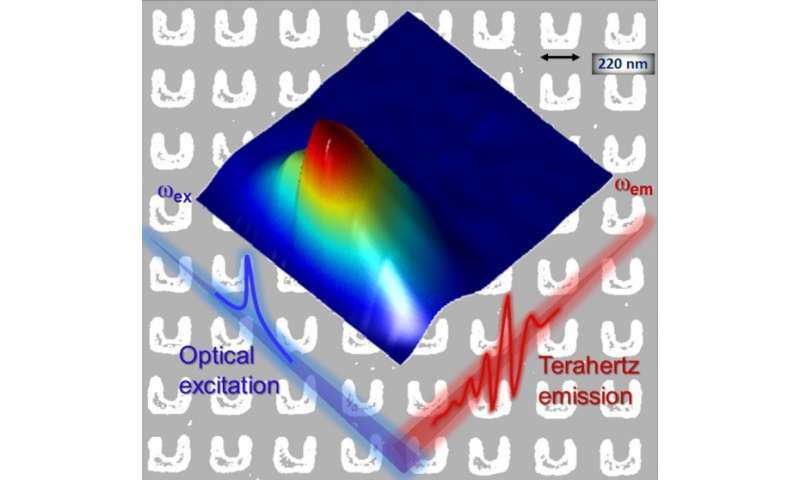 Scientists at Ames Laboratory, Iowa State University, and Karlsruhe Institute of Technology in Germany have discovered that when a two-dimensional array of nanometer-sized gold metamaterial resonators is illuminated by a tunable near-infrared femtosecond laser, with wavelengths matching the magnetic resonance of the metamaterial, a strong broadband of terahertz electromagnetic waves is emitted.